The greatest challenge during the search for the lost Peralta Mines has been coming to grips with just how big the mining operations actually were. The cart ruts told of countless loads of ore going to First Water Canyon, but it didn’t completely “sink in”. Cerro Negra was pored over, trying to gain more understanding of the orebody and the mining that took place there. Dozens of rocks were gathered, cut, stared at with a loupe, outcrops were photographed, etc. It was known that the gossan breccias, high in Lithium, and the quartz veinlets were the keys. Finally, while looking at Cerro Negra with Google earth and rotating the view to look south, the full magnificence of the mining that had taken place was seen that had taken place, and it was breathtaking. The description is of an underground mine, but how can you see the walls of an underground mine? It is surmised that the only thing it could be referring to is “subsidence” or the “cave zone”. 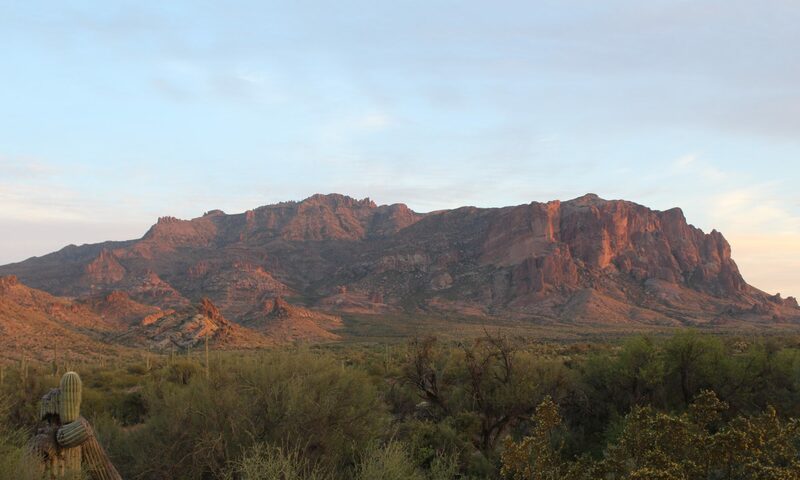 The article said the prospectors found the mine in 1888, and they went on to find ore much richer in the Goldfield area. If this large cave zone was seen it 1888, it certain that it is still able to be seen today, even if erosion has taken place? The only mining method available in the mid-1800’s and earlier for mining bulk ore was the top-slicing method. This was the precursor to block-caving and top-slicing was used at Inspiration and Morenci, Arizona. Below is diagram of a typical VMS deposit. The Cerro Negra orebody is a little different in that it was formed under a layer of basalt, about 100 feet thick, but there is still abundant jasper, and jasperoid that vented through the basalt to the surface. This is photo below is looking south towards the Cerro Negra ore body. 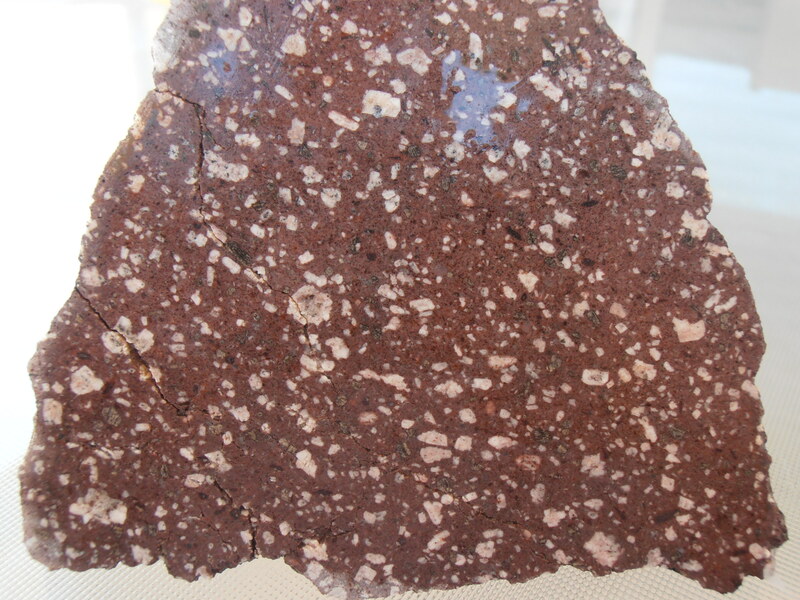 Much of the center of the uppermost portion of of the deposit has been removed that borders the rhyolite, forming a deep subsidence zone; It is guessed that a thickness between 20 to 40 feet was mined. It appears that they focused on the richest supergene ore beneath the drainages. There is definite proof of subsidence, and this is on the ridge just north of Cerro Negra (the photo is looking south). This probably appeared long after 1848, after the timber posts and matt rotted and compressed. These are beds of silicified tuff that are tipped upwards; their edges are not eroded (Flatiron is in the background). Even though a lot of mining took place here, they still barely scratched the surface. The “breccia dike” labeled on the photo above is about 10 feet wide. 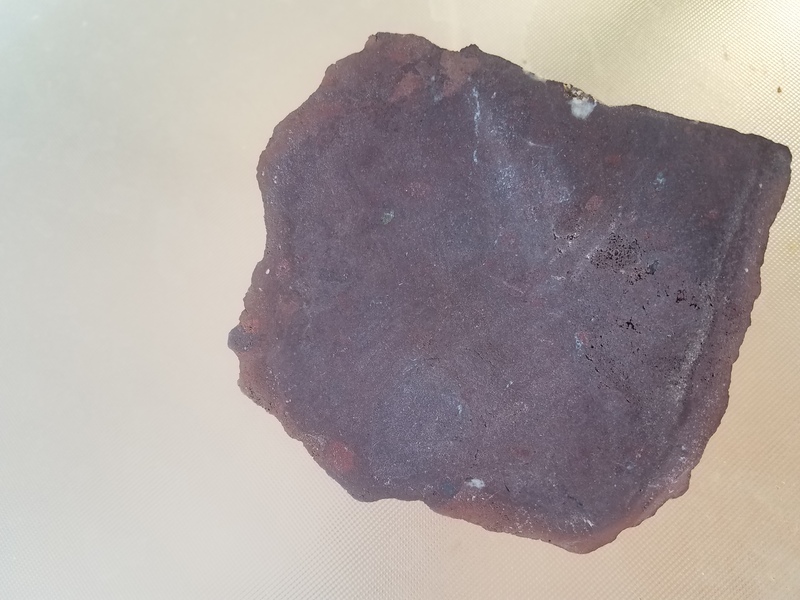 It looks knobby, and pretty blah in the field due to oxidation, but below is a photo of what some of this rock looks like after it is cut; it is jasper and chlorite. There are large cobbles of jasperoid in the dike also. The spot labeled “portal” in the photo had bees flying out from beneath large rocks during the worst of the recent drought. They were going for water. 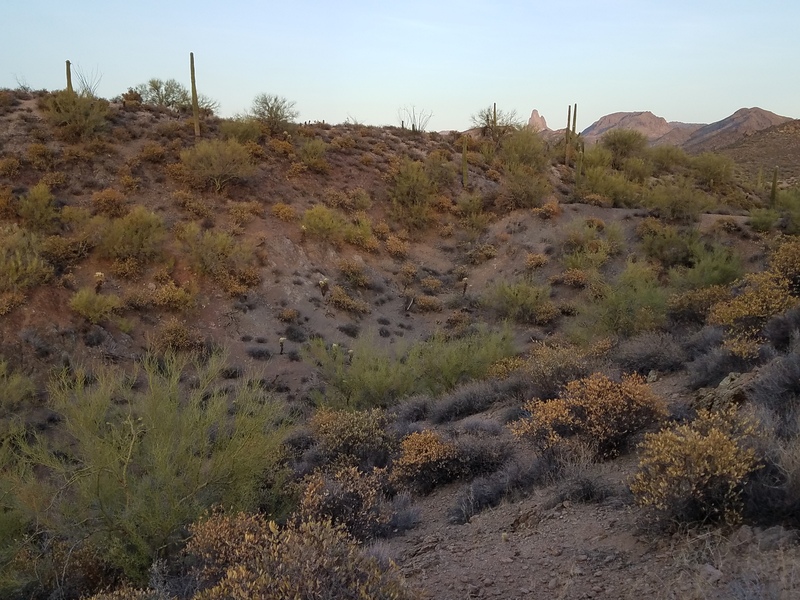 A hole was dug down at the rock face above the bee hole and the brow of a tunnel is believed to have been reached with a shovel; there was a great stash of saguaro fruit there from pack rats, so there is a significant void. 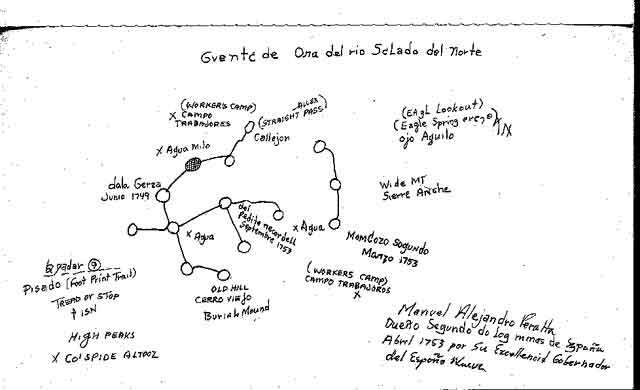 It is believed that this is the portal indicated on the Ortiz Map below (thanks again Tom Kollenborn). 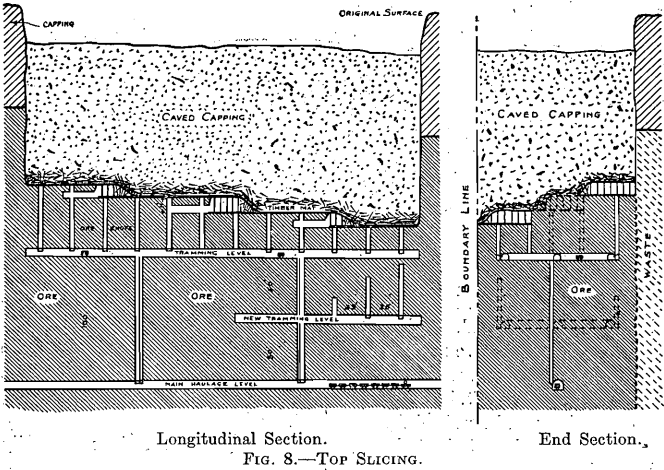 If it is orientated the same as the diagram above, it can be seen that they had several tunnels into the caved zone, and they explored extensively along the rhyolite front. It is believed that some of these tunnels were used to assist in draining water after the exploration and delineation. Ironically, the first time the author ever stepped foot in the “cave zone” was about 12 years ago. It was late in the afternoon after the sun went down, and after seeing all the veinlets and alteration on the east side of the depression, the author’s legs actually started shaking. It was known that it was something good, but had no knowledge of VMS deposits, and it wasn’t even known that the neck of the volcano was only about 200 feet away. 10 contiguous claims were held at the time, and felt it extremely important to put a claim on this ground, so unknowingly put the center of claim marker #11 right in the middle of the cave zone, creating a claim separate from the rest. That one claim, at the same bearing N20W as the other 10, covered almost the entire deposit and aligned perfectly with the cave zone it is now known. 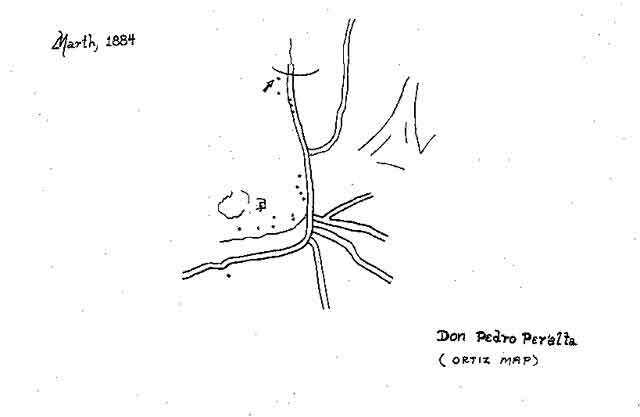 From almost the time #11 was staked, the author has believed that the satellite workings on the right side of the Burbridge map (thanks again Tom Kollenborn) were at Cerro Negra, but could not “see” before discovering the cave zone the relationship and alignment. It has always been the author’s belief that the Burbridge Map with the title, “The Esteemed People of the Salt River District of the North” was a map of an exploration project. The original was dated by the U of A as truly being from the 18th century. Considering the Spanish drove a tunnel several miles long to drain the mines of Pachuca in the 18th century, this really was “light work” for them. 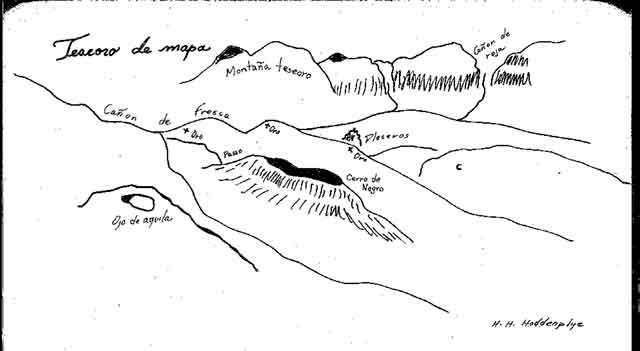 Where the crew of Mandozo Segundo Marzo drove their tunnels and sunk shafts in 1753 is likely where the cave zone is today. They simply blocked out the ore for others to follow, and it took almost 100 years to create the cave zone that remains today. Below is a diagram of the old top-slicing mining method. If this is indeed a cave zone shown above, this is how they did it. This takes quite a bit of timber, and the Peralta’s did not have much nearby. This must have been the number one limitation regarding the amount of tons they could mine from underground. Below is a photo of the cave zone next to the saddle area. In the background can be seen El Sombrero at the bearing of S65E. It appears like the rock over the stope is STILL subsiding even today on the sides of the cave zone as the decayed timber mat is crushed below. Below is the same diagram that has been modified to show the situation of the deposit at Cerro Negra. A layer of basalt covers the deposit, and jasper, jasperoid, and some gossan has been ejected through the basalt. The ejected material can be found in large quantities today. Because of the abundant limestone cobbles that were beneath the basalt before the VMS was emplaced, jasperoid replaced the limestone, and some jasperoid cobbles have been ejected also.